On the 600 block of Florida Avenue there is a dyanamic community arts organization called CapoeiraDC (www.capoeiradc.com). CapoeiraDC is a community-run nonprofit organization dedicated to fostering the Afro-Brazilian martial art of capoeira in the nation’s capital through classes, community outreach and access, and youth development. Capoeira is a unique blend of martial arts, dance, and music that evolved from the vibrant Afro-Brazilian culture. Sounds great. I’m sure lots of folks have walked by this space dozens of times. Very cool to learn more about it. You can find more info here. It’s great that Capoeira is getting more mainstream exposure like this. There are some other great spaces for capoeira in DC. For the regional style, which is more upright, faster and more agressive, there is this place as well as Barro Vermelho with Contra Mestre Bomba at Bloombars, and Officina da Capoeira with Carlos at BETA. For the Angola style, which slower and lower to the ground and relies more on trickery and strategy, there is a class taught at ECAC on euclid street. In warmer weather, you can also see people of different groups practicing together in rodas in the park (like Meridian Hill) Keep up the good work, POP. I’ve been to a few classes at the Capoeira Spot. It’s an awesome group of people having a ton of fun. Can’t get much clearer than that. Much recommended. Capoeira Spot has become my second home soon after I got introduced to the art. The combination of SUPER work outs in class, a great community of friends, and an exciting world of culture and history has captured me for over three years by now. I believe that the Capoeira Spot is a unique cultural center where the color of your skin, your social status, and your physical abilities do not matter. We are all students in the Spot and we are all seeking to learn more. I’ve travelled the world playing capoeira and this is one of the best places I have seen. Great capoeiristas and an energy that is indescribable. Any capoerista looking to see the best of DC should make this their stop. CapoeiraDC is a great place to learn samba! Sonia is the best teacher!!!! It’s great to see CapoeiraDC getting the attention it deserves. To echo Onca’s comment, CapoeiraDC is like a second home to many, many people. There are amazing events and classes, and even more amazing people. If you’re interested in learning more about the group check out the website (above) and Facebook page: http://www.facebook.com/#!/capoeiradc. After two years at The Capoeira Spot I’m thinner, stronger, more flexible and I have a bunch of new interesting friends. And I can play a decent Capoeira game! The Capoeira Spot is full of high achievers who also know how to enjoy life. Kudos to the Spot’s high-powered Management Team. I’m very new to the Capoeira spot, but from the minute I stepped in the building I was treated like family. Capoeira is very new to me, but it has grown on me fast. The passion for Capoeira in this building is infectious and you can’t help but to catch the fever. The people you come across in this spot are very passionate and supportive of each other within Capoeira and outside of Capoeira. Yes, there is a good family vibe there. It feels like home, not some mechanical and cold facilty, but a home. I got introduced to Capoeira Males by a friend of mine who wanted to try it. I remember going to the movie theater to see “Only the Strong” and just netflixed it earlier this year to watch it again. I really enjoy it and wish I could go more often; I am working on my schedule to come more frequently in the new year. When you’re at work, you think of the sway of the ginga, you picture a variety of movements, and you hmm the songs sung in class. If you haven’t been, it’s time to try something new in 2011 (just one class) and then you can decide if it’s for you. This place is a blessing for the community. The video above is very helpful in showing those who are new to Capoeira that it as a martial art it is closer to an intense form of interpretive dance than hand-to-hand combat. Capoeira Males is a wonderful community! I’m so thankful that we have a great capoeira school in the DC area led by passionate teachers. I highly recommend checking it out! 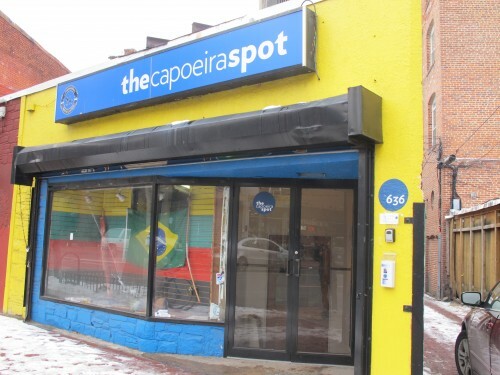 Want to try check out the Capoeira Spot? Try a free class for beginners 6:30pm to 7:30pm on Monday, 6:30pm to 8:15pm on Wednesday, and 12:00pm to 1:00pm on Saturday. Or bring your kids to the youth class on Saturdays at 10:00. No matter your age, background, or skill level there is something for everyone at the Capoeira Spot! The Capoeira Spot is really an awsome place to learn and train capoeira contemporanea. The Spot loves newcomers and after each class you carry away a sense of pride and a newfound respect for this sacred martial art/dance. Scuttlebutt: Could Starfish Cafe be Closing Soon?